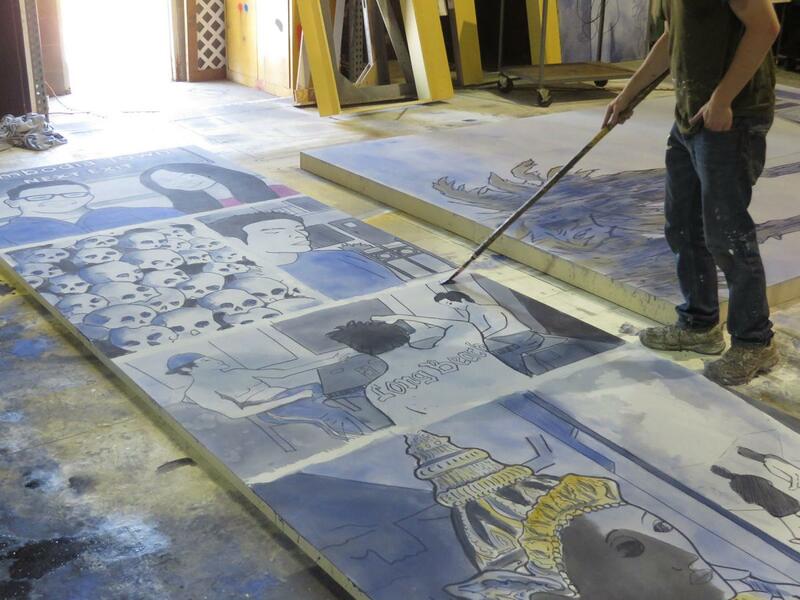 At a Marlborough, Massachusetts warehouse, the floor is jam packed with illustrated panels. In shades of blues and greys, they’re sprawled across the ground and are beginning to creep up the walls. Larger than life, the imagery they evoke feels miles away from Massachusetts—and it is: the scenes they depict are mostly of Long Beach, California. A few are of Cambodia: the ruins of a Buddhist temple, a pile of skulls. Brett Rochford works for BeNT Productions, MRT’s longtime scene shop partner. As Charge Artist, he helps make sure Scenic Designer Randall Parsons’ vision is effectively executed by the build team - specifically when it comes to the painting and texture. For Year Zero, that carries a somewhat unusual responsibility: replicating a set of hand-watercolored illustrations done by Parsons, at 24 times their original size. He’s currently in the thick of the work, painting with a brush affixed to the end of a long pole. Comics are referenced throughout Year Zero, and the illustrations are in a “graphic novel style” (Parsons, like the character Vuthy, is quick to draw the distinction from comics). Heavily focused on line and form, they retain a great deal of artistry without aiming for literal representation. The notion might seem whimsical, but Parsons’ inspiration for the illustrations originated in a practical matter: the action of the play takes place almost exclusively in Vuthy and his sister Ra’s apartment—but not quite. There’s a scene at a temple; another in a car. How to create continuity in the set for those isolated scenes? 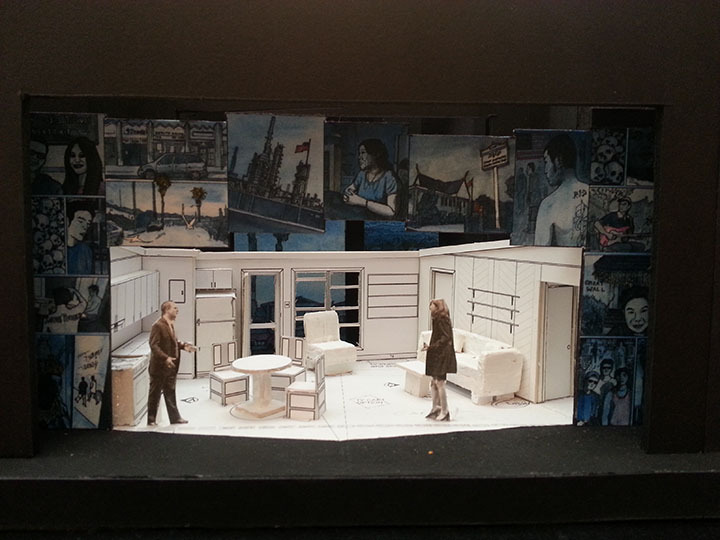 The panels, which will frame the stage and infuse the set, offer a unified lens through which to watch the action. This lens carries possibilities for reinterpreting the play; Parsons explains that the panels help bridge between the real and the imaginary. Perhaps it’s a “memory play,” the reminiscences of Vuthy long after the curtain closes, drawing the graphic novel he’s always aspired to draw and thinking back to his youth in Long Beach? 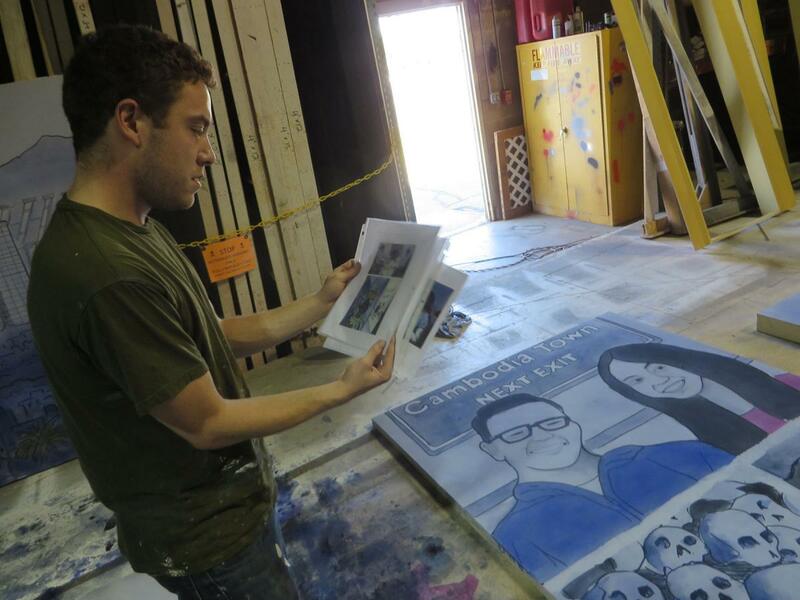 Meanwhile, back at the Marlborough scene shop, Brett Rochford puts the finishing touches on the scenes that will soon grace the MRT stage. His brush is fixed to the end of a long pole and dipped in watered-down scene paint; acrylic-based, it “extends” easily, blurring colors to match designer Parsons’ originals. 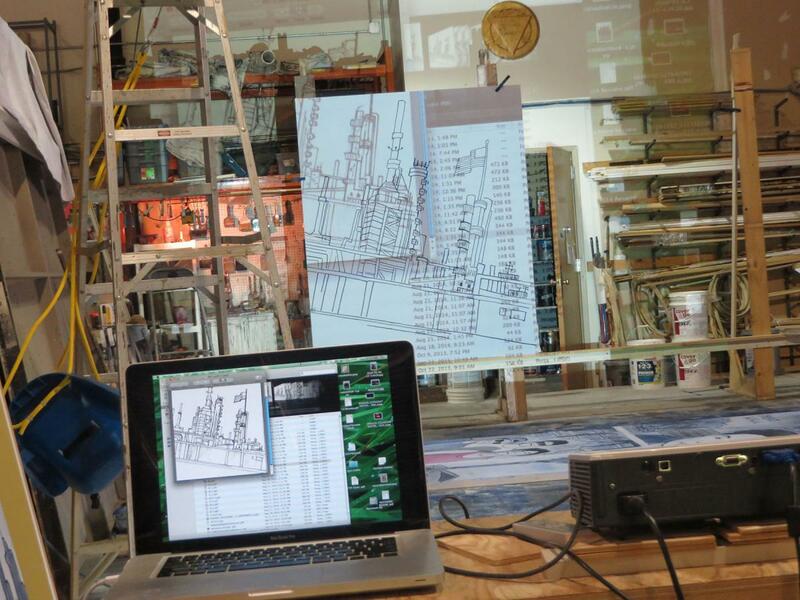 Another scene is still in the early stages: a digital line drawing, derived from the watercolor, is projected directly onto a blank panel, where it is traced and filled. The works Parsons cites as his inspirations for the set (The Watchmen, The Walking Dead) are more in the “graphic novel” camp than they are “comics.” But the superhero sensibility is palpable. The world should be a fitting one for the likes of Vuthy, Ra, Han and Glenn—and for all of us watching. Read more about Year Zero.